Charles was born May 5, 1882 in Cincinnati to German and French immigrants, Mathias and Mary (Demith) Kneisel, and attended public schools. For five years before joining the Cincinnati Police Department he was a coachman clerk. He joined the department as a Substitute Patrolman on April 5, 1911 and was assigned to District 1. 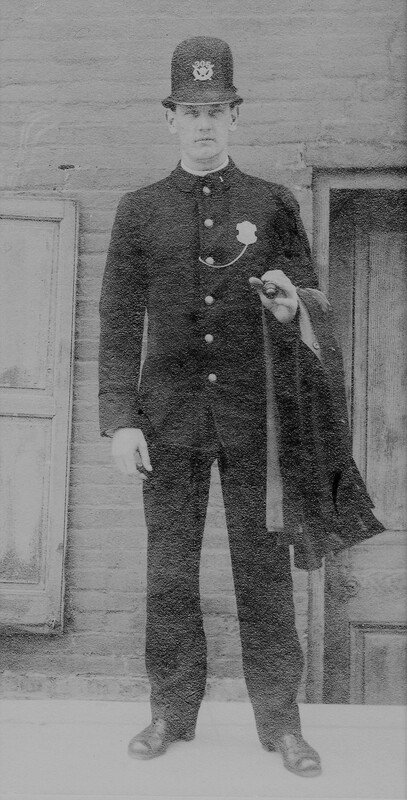 He was then promoted to regular Patrolman on May 3, 1912. He transferred to District 8 and then in 1919 to District 10. When District 10 was dissolved into District 5 in 1923, he was assigned to Mounted Patrol. When the Mounted Patrol was terminated in 1927, he went back to regular patrol in Cumminsville. On December 17, 1937 Patrolman Kneisel was on duty in Cumminsville when he was dispatched to a trouble call at Mohawk Street and Stonewall Avenue. On the way, the scout car he was driving skidded on a streetcar track and careened into a loading platform in front of 3043 Clifton Avenue. Robert Feldhaus and John Kohnie, both of Walnut Hills, were first on the scene, extricated Patrolman Kneisel, and carried him to Good Samaritan Hospital about a block away. He died from a crushed thorax and hemorrhage as he was being taken inside. Sergeant Guy York and Patrolmen James Bonner and Rex Burdsal of the Safety Patrol investigated. Patrolman Kneisel was survived by his wife, Anna (McCarthy) Kneisel (55) of 4042 Colerain Avenue, and three children; Ethel Kneisel (25), Ruth Kneisel (23), and Charles R. Kneisel (21). He was buried in Spring Grove Cemetery on December 22, 1937, at 3 p.m. Anna joined him 20 years later during March 1957. If you have information, artifiacts, or images regarding this officer or incident please contact the Greater Cincinnati Police Museum at memorial@police-museum.org. This narrative was researched and revised on December 14, 2014 by Cincinnati Police Lieutenant Stephen R. Kramer (Retired), Greater Cincinnati Police Historical Society President. All rights are reserved to him and the Greater Cincinnati Police Historical Society.